Remove stems and wash blueberries. I mash my blueberries by pulsing them in a food processor. Bring fruit with calcium water to a boil. Then add pectin-sugar. Submerge filled jars in boiling water. I was so excited to finally see blueberries being sold in large baskets for a very reasonable price. Usually they are so expensive I would never even considering buying enough of them to make jam. But last week I found big, plump blueberries begging to be canned! By now you have probably seen my low sugar recipes using Pomona's Universal Pectin. This is the only pectin I've ever found that allows you to make jam using as little as 3/4 cups of sugar to 4 cups of mashed fruit which is about 1/4th of the sugar used in the "low sugar" Sure-Jell recipes. By being able to use a small amount of sugar, you can really taste the fruit. Sure-Jell is so sweet you can't really tell what kind of fruit you are using. You can probably make jam out of your old sneakers and it would taste the same. See my Sugar Free Apricot Jam, Low Sugar Plum Jam, and Low Sugar Strawberry Jam recipes, all using Pomona Universal Pectin. You and your kids will love this fresh and healthful blueberry jam on peanut or almond butter sandwiches. Doug and I had almond butter and blueberry jam sandwiches for lunch today and they was amazing! Home made blueberry jam is also excellent on pancakes, muffins and even as a topping for ice cream. The following recipe was derived from the Pomono package. 1. Wash and rinse jars. Bring lids and rings to a boil; turn down heat and let stand in hot water. 2. Prepare blueberries. Remove stems, wash well, rinse and mash. You can pulse in a food processor if you have one. Measure 6 cups of mashed blueberries and put into a pan along with the lemon juice. 3. Add 3 teaspoons of calcium water into the pan and stir well. 4. In a separate bowl, thoroughly mix 1 1/4 cups sugar with 3 teaspoons of pectin powder. 5. Bring fruit to a boil. Add pectin-sugar mixture: stir vigorously 1 to 2 minutes while cooking to dissolve pectin. Return to boil and remove from heat. 6. Fill jars to 1/4 inch of top. Wipe rims clean. Screw on 2 piece lids and put filled jars in boiling water to cover. Boil 10 minutes (add 1 minute more for every 1,000 feet about sea level). Remove from water and let jars cool. As they cool, the seals-lids should be sucked down (you'll hear them pop). Lasts about 3 weeks once opened. Per tablespoon: 18 calories, 0 g fat and cholesterol, 0.1 g protein, 4.6 g carbohydrates and 0.4 g of fiber. Gout is an condition that results from having too much uric acid in the blood. It's actually a form of arthritis. When the uric acid crystallizes in the joints, it can cause severe pain, usually in the big toe. People who have gout are often males (90% are men) who eat and drink too much and are overweight but this is not always the case. Several years ago I was shocked to find that the excruciating pain in my husband's toe was diagnosed as gout. At 49 years old, trim and eating a balance "plant centric" diet, he did not exactly fit the profile of someone with gout. But he had it, none the less. We went into "overdrive" trying to find a natural way to cure this painful condition. Meat: Beef, pork, lamb, meat-based gravies, poultry and organ meats. Seafood: Anchovies, codfish, haddock, herring, mussels, sardines, scallops, trout and fish eggs. Vegetables/Legumes: Asparagus, cauliflower, mushrooms, spinach, peas, lentils dried beans. Other things cause cause a rise of uric acid which can lead to gout. These include stress, injury, chemotherapy, obesity, kidney failure and potassium deficiency. Fresh or frozen cherries can neutralize uric acid. Cherries are in season right now so eat plenty of them. You can also drink unsweetened cherry juice. Strawberries are also beneficial. * Avoid the high purine foods listed above, especially meat. Avoid sugars, saturated fats and rich foods like cakes and gravies. Reduce diuretic foods, coffee, sodas, tea with caffeine, and alcohol. * Eat lots of raw fruits and veggies along with some grains, nuts and seeds. * Drink lots of pure water. Many recommend distilled. I've also seen some recommend alkaline water. * Eat foods high in potassium. The RDI of potassium is 3,500 mg and it's safe to take more. Foods high in potassium include baked potatoes with their skins, yams, bananas, avocados and dried apricots, to name a few. Drink high potassium Potato Skin broth. See recipe below. While researching this topic, I found a number of natural supplements that support the immune system and have antioxidant and anti-inflammatory properties. Many of them contain cherry extract, turmeric (a powerful antioxidant) and rutin (a citrus bioflavonoid). Check out the Gout Treatment association for a review of Top Natural Gout Treatment Options. Their top pick is Uricelax. Uricelax contains tart cherry extract along with natural COX-2 inhibitors that relieve inflammation. Other ingredients are said to "minimize uric acid accumulation in joints, decrease water retention, promote healthy kidney function and promote healthy immune system function". In a 12 year study of 47,000 middle age men, Massachusetts General Hospital researchers found a strong connection between weight loss and a substantial reduced risk of gout. They noticed that men who had gained 30 or more pounds in adulthood doubled their risk of getting gout. But men who had lost at least 10 pounds cut their risk of gout by 40%. They also found that gout risk increases with high blood pressure and the use of water pills (diuretics). Although losing weight is important for gout management, it is not healthy to go on a crash diet since that could result in an increase of uric acid levels in the blood. Avoid aspirin as it can raise the level of uric acid in your blood. Ibuprofen does not do this so if you are going to take pain killers, only use ones with ibuprofen. Combine ingredients and simmer covered for 1 hour. Cool, strain and drink. Record Breaking Temperatures Throughout the U.S. Although it's been an unusually cool summer here in Northern California, the rest of the country seems to be enduring extreme heat. This weekend, a number of cities reached triple digits. This kind of heat can be dangerous and it's important to do everything you can to cool off. One method people sometimes miss is their diet. The heating and cooling properties of food are very important qualities used in Chinese medicine. The type of food as well as the method it is cooked, or not cooked, all contribute to these properties. Foods eaten raw are more cooling that those that are cooked. Cooking foods over a long period of time at high temperatures will add warming qualities to your food. To protect the cooling nature of the food during cooking, it is better to steam or sauté and avoid deep frying and baking. To stay cool, avoid foods such as butter, ginger root, anchovies and oats, to name a few, as they all have warming qualities. Looking at the list of cooling foods, I thought that tabouli would incorporate quite a few of them like; wheat, tomato, cucumber, mint and lemon juice (citrus). I even added sweet corn to the recipe which is not in traditional tabouli but is an additional cooling food that goes well with the other ingredients. Except for the cracked wheat which is just soaked in hot water, the rest of the ingredients are raw which also optimizes their cooling nature. For a completely raw recipe, check out my Raw Tabouli recipe. Mix hot water and cracked wheat (bulgur) in a bowl and let sit for about 30 minutes or until the water is absorbed. Stir occasionally. After it has absorbed all it's going to, drain any excess water. Set aside. In a large bowl, mix together the dressing ingredients then add cucumber, tomato, green onions, corn, mint and parsley and toss together. Add the soaked bulgur and combine. Adjust the salt and pepper and refrigerate covered for an hour so all of the flavors combine. Serve chilled or at room temperature. Per serving: 191.4 calories, 7.8 g fat, 1.0 g saturated fat, 0 mg cholesterol, 5.0 g protein, 29.3 g carbohydrates and 7.1 g of fiber. Sauté smashed garlic cloves and chopped onion. Peel and chop the zucchini. Don't throw out your zucchini peels. Make this raw salad! Every year I grow way too much garlic. My peak crop was almost 400 heads. This year I controlled myself a bit and only grew about 100 heads. See how easy it is to grow your own garlic in my posts, Growing Garlic In Your Home Garden and Harvesting and Curing Garlic. So what do you do with a bumper crop of garlic? One idea is to make this healthful garlic soup. There is no need to wait until your garlic is cured to make this recipe. It tastes great when you use "fresh", uncured garlic. (Garlic from the store works just fine also). If you simply have too much garlic from your garden to use up, try making your own Garlic Powder. Why is there Zucchini in this Garlic Soup? As I was experimenting with different ways to make a garlic soup, I happened to be at my friend Ray's house. He is a gardener extraordinaire and always plants way more veggies than one family can possibly consume. This year he exceeded the legal limit of zucchini. One plant is enough for a family, two for the neighborhood but he has over a dozen. Seriously - an entire city can be fed with the amount of zucchini he has coming out of his garden. Lucky for me, I got to go home with an entire bag of it. Hence the 8 cups of chopped zucchini in this recipe. I also added cannellini beans to thicken the soup and provide an extra shot of protein and cholesterol lowering qualities. Because I wanted a white garlic soup, I peeled the zucchini. As I was peeling them, however, I felt a tug at my heart as the beautiful fresh peels were landing in the sink. I quickly scooped them up, rinsed them off and decided to make a nice raw salad. I just placed them in a bowl, tossed them with my Home made Balsamic Vinaigrette Salad Dressing and topped the zucchini ribbons with a few fresh blueberries and chopped walnuts. Using the peels left over from this garlic soup recipe mades about two servings and Doug and I munched the salad while we were waiting for the garlic soup to simmer. For other raw zucchini recipes, see Raw Zucchini Spaghetti with Walnut Meatballs or Raw Vegan Lemon Basil Pesto on Raw Zucchini Spaghetti. For a raw zucchini soup try Creamy Raw Vegan Zucchini Soup with Crushed Pistachios or Raw Zucchini Soup topped with Raw Goat Milk Feta. Garlic is a true power food. It's phytochemicals include saponins, quercetin and organosulfurs like allicin. To get the most health benefits from garlic, make sure you chop or smash it and let it rest for at least 15 minutes before cooking. Garlic has associated with health benefits such as lowering cholesterol, lowering cancer risk, having antibiotic, anti-viral, anti-parasitic and anti-fungal qualities. It has also been said to have a blood cleansing properties and also the ability to bolster immunity. It's a component of the healthy Mediterranean diet. Peel and smash garlic cloves and set aside for 15 minutes while the beneficial phytochemicals in the garlic are developing their healthful qualities. Sauté the garlic and onions slowly in olive oil over a low to medium heat for about 10 minutes. They will become clear - do not brown. Add broth, zucchini, bay leaf, thyme, sage, salt and pepper and cannellini beans. Bring to a boil and then lower heat and simmer, partially covered, for 45 minutes. Turn off the heat and remove bay leaf. Blend the soup until smooth by putting it into a blender or using a hand blender in the soup pot. Stir in the lemon juice, adjust salt and serve topped with fresh parsley, parmesan and some additional freshly ground black pepper if desired. Per serving: 222.5 calories, 4.8 g fat, 1.0 g saturated fat, 2 mg cholesterol, 11.4 g protein, 36.7 g carbohydrates and 14.8 g fiber. I made this salad for the seafood lovers at our annual family summer solstice party. It's quick and easy and the shrimp, marinated artichoke hearts, avocado and olives blend together perfectly. It is tossed in the marinade of the artichoke hearts and mixed together with fresh basil. What can be more simple? Shrimp are a good source of protein while being low in calories and saturated fat. They are also an excellent source of the important trace mineral selenium. Since raw food vegan diets are missing vitamins D and B12 as well as the important EPA and DHA omega 3 fatty acids, shrimp are a good occasional diversion in order to obtain these critical nutrients. They are also a good source of iron, phosphorus, niacin and zinc. Seafood also is a good source of iodine which the body needs for the production of thyroid hormone. Because the consumption of iodized salt is down, there has been a dramatic decline in iodine consumption over the past few decades. Besides thyroid problems, iodine deficiency can lead to birth defects. Defrost the shrimp according to package instructions. Rinse shrimp and drain well. Remove tails if they are still on the shrimp. In a small fry pan, heat olive oil and sauté garlic for a minute or two. Add shrimp to the pan and top with several pinches of salt and pepper. Cook until pink, stirring frequently. This will only take 3 to 5 minutes. Do not over cook. Remove from heat and let cool a bit. Drain artichoke hearts saving the marinade. If the artichoke hearts are large, slice them in half. Place sliced artichoke hearts in a bowl, add the drained black olives, shrimp, avocado, fresh basil and 3 to 4 tablespoons of reserved marinade. Gently toss until combined. Adjust seasoning for salt. Top with more fresh basil and freshly ground black pepper and serve. Per serving: 180 calories, 11.3 g fat, 0.8 g saturated fat, 100 mg cholesterol, 12.7 g protein, 9.3 g protein, 4.2 g fiber and 322 mg omega 3 fatty acid. Raw cucumber avocado dill soup. Garden of Eden salad with creamy ginger dressing. Live wrap with cashew sour cream. Raw vegan lemon cheesecake with raspberry topping. Chocolate chai vegan soft serve. When my son and his family moved from Seattle to Portland, Oregon I was pretty happy because they were moving within what I consider reasonable driving distance from where we live in Northern California. What I didn't know at the time is that I would become even happier when I realized that this town has a plethora of amazing restaurants. Doug and I drove to Portland this week to bring our 7 year old grandson home who had been staying with us. It was a very short visit (one day up, one day there and one day back) but we still managed to try 2 new restaurants and one old favorite while in this great town. On this visit, I would say the most memorable one was the Blossoming Lotus. Portland, Oregon is an extremely vegetarian friendly town with plenty of delicious vegetarian restaurants to choose from. Blossoming Lotus, on Broadway and NE 15th street, is certainly one of them. We decided to have lunch there on Wednesday. They offered an all vegan menu with many "Live" or raw food appetizers, soups, salads, entrees and desserts as well as a good assortment of raw juices, smoothies and specialty drinks. Walking in, it had a warm feeling and good energy. There was a diverse crowd from young people to baby boomers. For lunch, we ordered at the counter and they delivered our food to the table. We started the meal with the raw cucumber and avocado dill soup. It was light with wonderful crisp flavors. Our "neighbor" ordered a Garden of Eden side salad with creamy ginger dressing. Although we didn't eat it, it looked extremely fresh as you can see from the photo. For entrees, we had a Live Wrap and the Green Goddess Bowl. Both were good sized portions. The Live Wrap was filled with cucumber, sprouts and carrots. It also had a tasty tahini-cilantro pate inside and was flavored with an avocado goddess sauce. The wrap itself was a tender collard green and it was served with an amazing cashew sour cream. The dish was $10, plentiful and worth ever penny. The Green Goddess bowl was my favorite. This hearty bowl was a combination of steamed kale, mixed raw greens, sprouts and brown rice (you can also get quinoa). It was served with avocado goddess sauce and roasted garlic balsamic vinaigrette and topped with regular and black sesame seeds. It was a truly wonderful dish and my only regret is that I'll probably order this every time I return and may miss out on ordering something new. It was a large amount of food and a bargain at $9. Our neighbor ordered the Crispy Thai BBQ wrap for $8. It had these interesting "soy curls" inside. In addition to soy curls, it was filled with crispy rice sticks, carrots, cucumber, red cabbage and romaine lettuce. It was flavored with a sweet ginger sauce and wrapped in a whole wheat tortilla. It looked amazing and I'll have to try it next time if I can resist ordering the Goddess bowl again. By now, you must think we eat like pigs because this was a lot of food to try. But since I wanted to do a good job with this review, we made the sacrifice of trying two desserts. The raw pie was good but not unusual for a raw restaurant. If you've never eaten a raw cheese cake, you're in for a wonderful treat but I've tried quite a few at different raw restaurants and this one was very good but not memorable. The soft serve, on the other hand, was to die for. I do not eat dairy since I'm lactose intolerant so I dearly miss soft serve ice cream. The chocolate chai was delicious. Unfortunately, they only serve one flavor at a time so if you don't like their daily selection, you're out of luck. Although we didn't try them (there is actually a limit to what we can consume), they had a big bowl of lovely vegan cookies and brownies at the counter. So if you're in Portland you might want to give this place a try. They are open for lunch and dinner and offer a Sunday Brunch. Check out their Location and Hours and their Lunch, Dinner and Brunch Menus. They also have an interesting Cocktail Menu. Whether you are BBQ'ing tofu burgers or pork spare ribs this 4th of July, why not enjoy healthful, meatless side dishes? The most popular side dishes on the 4th are potato salad, corn on the cob and baked beans. Here are a few recipes that will please all of your guests, especially your vegetarian friends. This Vegan Potato Salad is made with a fresh and light lemon and oil dressing and a touch of inflammation reducing, cancer fighting turmeric. 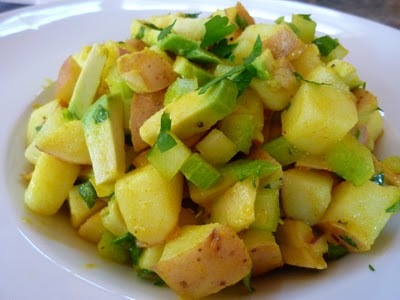 The turmeric gives the potato salad the color of "egg" potato salad without the cholesterol and the avocado provides the creamy texture without the mayo. 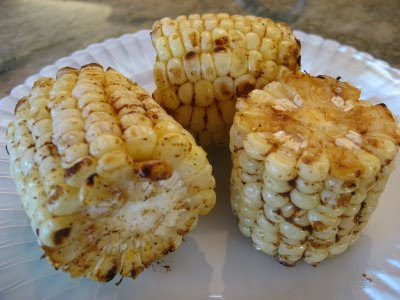 While the grill is hot, try making Coconut Chili Lime Corn on the Cob. Instead of butter, the corn is rubbed with expeller pressed, unrefined, organic coconut oil and freshly squeezed lime juice. Then it is topped with a touch of salt and chili powder. No 4th of July BBQ is complete without a big pot of baked beans. Sweet and Spicy Vegetarian Baked Beans with Green Chilies and Jalapenos have a nice combination of brown sugar sweetness with the contrasting heat from the chilies and jalapenos. Starting with ready made Bush's vegetarian baked beans, this recipe is easy to throw together. I slow bake the beans in my crock pot all day not only for the flavor but also for the joy of filling my house with their wonderful aroma! 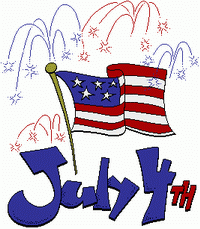 Have a happy and safe 4th of July and thanks to Webweaver's for the free 4th of July clipart!